Why Delmarva Shredding and Recycling? 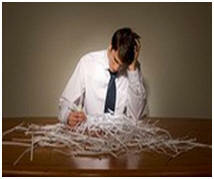 Tired of paying your personnel to shred your confidential records? Let us come to you! Located in Salisbury, MD, Delmarva Shredding and Recycling LLC has a mobile document shredding unit that will come to your Delmarva office location and shred all of your confidential papers. Our mobile services locations in Berlin, Cambridge, Ocean City, and Salisbury, Maryland including Georgetown and Seaford, Delaware. Let us help you combat identity theft. Your papers never leave your sight, and we do it on the spot! 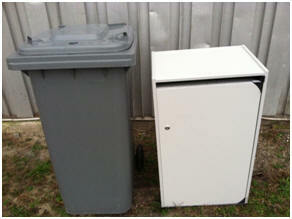 We can offer a variety of containers that will accommodate your recycling and paper shredding needs. Why is Paper Shredding Necessary for TOTAL Document Destruction? Your company's confidential records are an important asset. Their compromise could cause serious damage to you or your clients. At Delmarva Shredding and Recycling, our business is the destruction of those records that have come to the end of their life cycle. Who is Delmarva Shredding and Recycling? Offering the secure destruction of your records is not a side-line - IT IS WHO WE ARE! Licensed and insured, we have an uncompromising commitment to security and customer service. Our mission is to serve you with the highest standard of security, safety and efficiency you can find. Not only do we shred and recycle paper, but we also offer plastic recycling and vinyl recycling on the Eastern Shore of Maryland, Delaware and Virginia. How is Document Destruction Security handled when Delmarva Paper Shredding is Recycling Documents? Using a distinctive fleet, a variety of lockable containers and our secure facility, we work together with you to ensure the strict confidentiality of your records. Delmarva Shredding & Recycling can help you meet today's privacy requirements. Whether it is HIPAA or FACTA requirements, or if you just want to protect your own identity, we are here for you. Stop drowning in your old office papers and let us help you securely remove them! Give us a try! You'll love the service, save yourself time and money while helping the environment! Announcements: Delmarva Shredding proudly announces that it has expanded its services into Delaware and Virginia, including Seaford and Georgetown, DE. Their new service route locations are in Maryland, Delaware, and Virginia, which include Berlin, Cambridge, Easton, and Pocomoke City, MD as well as Accomac and Exmore, VA.
Delmarva Shredding and Recycling services Berlin, Cambridge, Easton, Ocean City, Pocomoke City and Salisbury, MD, Georgetown, and Seaford, DE as well as Accomac and Exmore, VA including surrounding areas on the Eastern Shore. They offer Plastic, Vinyl, and Paper Recycling across Delmarva. Copyright 2019 Delmarva Shredding & Recycling LLC. Web Solutions By Infoworkz Solutions Group, LLC.